LibreOffice is a free, open source office productivity suite that can perfectly replace another popular office suite Microsoft Office. The service includes a word processor, spreadsheet, presentation and graphics editors, applications, database, and formula editor. LibreOffice is a fork of the OpenOffice. The latter originated in 2002 and was in turn StarOffice heir, which was popular in the 90s. OpenOffice isn’t as well developed as it was in the past. LibreOffice has seen widespread adoption by OpenOfficeusers. The suite saves and opens files in the standard Open Document Format for Office Applications. It is an open ISO format that uses XML and the compressed ZIP files. 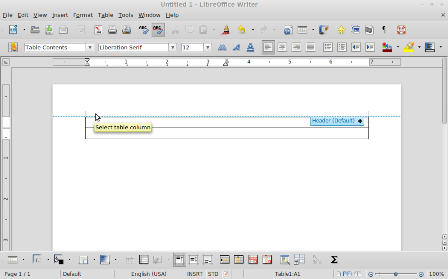 Among the native extensions of LibreOffice, it supports ODT, ODS, ODP, ODG, ODF and ODB. In addition, LibreOffice is compatible with other Microsoft Office formats. These include DOC, XLS, PPT, as well as the latest extensions (DOCX, XLSX, PPTX ...). It also supports other formats like BMP, JPG, PNG (import images), TXT, DXF and PDF (export only). 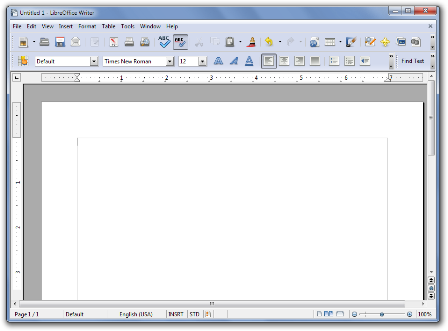 Writer is one of the most commonly used modules in LibreOffice. The program's interface resembles the look of a well-known Word, which will certainly satisfy the so-called ribbon-style haters. Here we can find a classic menu with commands such as File, Edit, Insert and toolbars. By default we have Standard Toolbar and Formatting Toolbar The first one lets you adjust text, change font, font size, alignment, bulleting and much more. The second allows access to basic document features, including saving, printing, opening, creating PDFs, copying, and inserting hyperlinks or tables. The icons resemble the look of the ones we can find in MS Office. Microsoft users shouldn’t have problems using them. Besides, users are provided with over 20 other toolbars. In most cases, they open automatically depending on what you are doing. For example when you insert a table, the Table toolbar will start automatically. But we can also turned them on and off using the menu View / Toolbars. Writer offers almost the same features as Microsoft Word. To refer to them simply browse to the top menu. The View allows you to activate and hide rulers, enable non-printing characters, modify, enlarge or switch to full screen. To add images and other non-text elements use the Insert menu. We have here Picture / From File option, which lets you apply pictures or graphics stored on the local hard drive. It also gives the possibility to insert comments, bookmarks, special characters as well as movies and sounds. What is more, Writer supports OLE objects, thus allowing smooth import of charts from a spreadsheet or presentation slide elements. When it comes to inserting tables, it is a relatively simple process– just click Table, insert, table. You will be presented with some basic options like selecting the amount of columns and rows and merging cells. Clicking in the table opens the table toolbar which offers quick access to formatting options as well as being able to insert or delete columns and rows. If you are interested in advanced text formatting, have a look at the Format menu. Here we can find the same functions that are in one of the default toolbar, along with less frequently used functions (change of streaming, belching, layout). Writer, like the whole LibreOffice, provides a spelling checker (only spelling errors) in Polish. We can access this function from the standard toolbar or the Tools menu. We can change the dictionary language. AutoCorrect function is turned on when Writer is installed and provides a long list of common misspellings and typing errors. It is worth taking a closer look on it, since it can help you disable the annoying behavior of your application, such as the automatic insertion of printing quotes or altering hyphens to dashes. When we want to use our text on the Internet, then auto-correction can cause problems when pasting text into a CMS or blog. Therefore, I do not use this feature. In Options, you can disable automatic detection of URLs ( they will not be converted into clickable blue links). If you want to share your document with others, LibreOffice comes with a direct PDF export function, allowing you to save in PDF, ensuring they see the way it was intended. Among the custom toolbars, one of the most widely used is the Table. This element of the interface is very clear and easy to use. We can change the border color and background, merge and split cells or add or delete rows or columns. The Drawing toolbar is also well equipped. It not only allows you to insert photos and images from your hard drive, but also to place AutoShapes in a text document, or different types of arrows, balloons, stars, etc. Added to this is the ability to draw lines. While using the Drawing, the appearance of upper bars changes. Instead of standard elements, the service displays options for currently selected drawing tool. We can for example change line thickness or color. Writer also has a smooth and fast search engine that opens just like any other toolbar or by using the popular shortcut Ctrl + F (Ctrl + H to Find and Replace). These commands are also available on the Edit menu at the top of the screen. In a week of time, we will present our next series on LibreOffice. This time we will discuss spreadsheet.